The parade of winter flowering orchids continues. Truly, this has to be one of the best years for a number of species flowering in my collection. Some of these plants are rarely seen in other collections. One of the most spectacular is the yellow-flowered form of Phragmipedium besseae var. flavum 'Winter Sun' x 'Hidden Agenda'. This is the second time this plant has flowered, and now, the flower scape has become quite robust and the plant is about 30 cm tall. It is not as robust as the typical for of this species, but it's no wimpy plant either. Here is a comparison of the plant shown above with a line bred specimen of the typical species (Phrag. besseae 'Haven' x 'Smokin'). Obviously you can see the differences in the proportions of the flower parts. No doubt this is a vastly improved flower over the wild type. Unfortunately, what you can't see, is the the terrible growth habit of the line bred plant. While there are several flowers per scape and the flower parts are larger and more robust, the plant does not readily form a clump. Instead in produces one anemic growth per year at the end of a long rhizome. This detracts severely from the overall display of the plant. The yellow form has flowers that more closely resemble the wild species type, forms multiple offsets, but only produces 1-3 flowers per scape. Speaking of Lady's Slipper orchids, this very rare form of Paphiopedilum micranthum var. eburneum 'Bubble Gum' x 'Huge Snow Ball' started to flower last year on this date. I purchased this plant in 2006 and it took 5.5 years to produce it's first flowers. It was well worth the wait. I am a huge fan of Cattleyas, but have stuck mainly with growing the species. 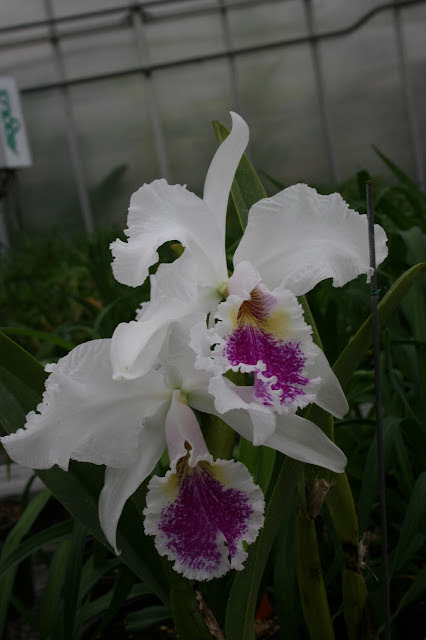 Last year a friend gave me a plant labeled as Cattleya 'Alecia'. I have not been able to find any information on this plant and suspect that it may be some kind of interspecific hybrid. Whatever it may be, one thing is for certain, this is a spectacular plant in full flower, and attracts droves of attention from anyone who happens to see it. The fragrance is alone makes it worth growing. Anyone out there know anything about the origin of this cultivar?